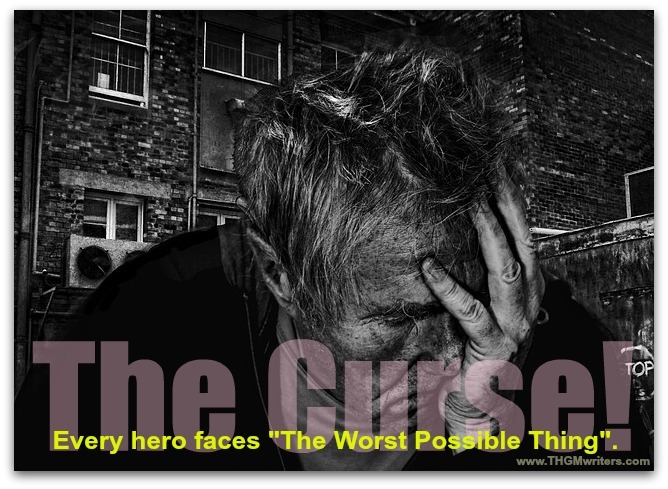 Every hero faces that moment when they are cursed – The Worst Possible Thing happens. It is upon the ruins of that curse that the hero can burst out in triumph! So says your main character, or a key character, at a critical moment. Your character in a period novel would most likely say this. Or your character in the modern era if he/she is given to hyperbole. You might think all three statements are over-the-top, but how many moments in life have prompted that same reaction from you? Of course, some people in fiction and life may never admit anything is a disaster even when the Titanic is sinking. At some point, whether it’s on page four of a novel or somewhere around page ten to fifteen of a screenplay, your character will run into something that is The Worst Possible Thing that could happen to them. The Curse. The Problem. It might even be a blessing that turns out to be the Absolute Worst Possible Thing. Think of the classic fable of King Midas. Initially, the god Dionysius grants him a wish in exchange for hospitality. Midas wishes that everything he touches turns to gold. Does King Midas live happily ever after and turn his whole place golden? How about Conviction starring Hilary Swank as Betty Anne Waters? In this movie based on a true story, Betty Anne’s brother Kenny is sent to prison for a murder Betty Anne is certain he didn’t commit. This is The Worst Possible Thing for Betty Anne, because she may lose her brother, among the only family she has–both Betty Anne and Kenny grew up in foster care. Betty Anne and Kenny don’t have a fancy lawyer and everyone assumes Kenny killed an elderly woman. Does Kenny rot in jail? By the way, the two things that King Midas and Betty Anne Waters have in common are (a) possible loss of family (Midas’s daughter, who turns to gold, and Kenny) and (b) dramatic desire/need. For King Midas, the Best Possible Thing becomes the Absolute Worst Thing when he slowly loses everything that makes his life meaningful: food, roses (golden roses no longer have scent) and lastly his daughter. For Betty Anne Waters, the Absolute Worst Thing becomes the Best Possible Thing when she improves her life by becoming a lawyer and, with the help of the Innocence Project started by Barry Scheck (Peter Gallagher), proves her brother innocent of the crime–in so doing, she heals her brother, who gains a newfound appreciation for his sister. This quote from Goethe begs the question: What if your characters’ accomplishments come from those broken pieces, mistakes and failures? After all, if your character is passive and isn’t doing anything, no possibility of a mistake, but no possibility of triumph, either. Some characters will simply refuse to act until their inaction itself becomes a mistake. Then, they need a bigger boat, as in JAWS. What if Midas never made his wish? What if he said, “Thanks but no thanks, Dionysius. My royal advisors say it’s a bad idea.” No story. No lesson. No realization that Midas is blessed to be the king and to have a loving daughter. There is a point in Act II of the screenplay The Dark Night of the Soul, in which your protagonist realizes all is lost. This is the catalyst for your protagonist to change–usually a MAJOR change. As Chris Soth writes in his Million Dollar Screenwriting ebooks, in A Few Good Men, Tom Cruise’s character Daniel Kaffee learns that justice isn’t just “a punchline” (as Jack Nicholson would say in that movie) and that taking the noble fight to Colonel Nathan R. Jessup is not only the Absolute Best thing for Kaffee as well as the Marines he’s defending and the wrongfully killed Private Santiago, it also results in one of the best lines in movie history. The worst day of your character’s life may be their best day. If your character is “undone,” he or she may learn that sometimes the life we planned needs to be undone in order to discover who we truly are and what we truly need. Great post indeed. Well I guess I’ve been the person who’s been habituated to say “This is the worst day of my life.” and I guess there may be several of these days. But for every worst things there’s always a best thing.